Itora Political Resident A senior ranking political representative (equivalent to a Consul General) from the diplomatic corps of the Government of India or one of its subordinate provincial governments, in charge of a Political Residency. , Bushire, at Bahrain. 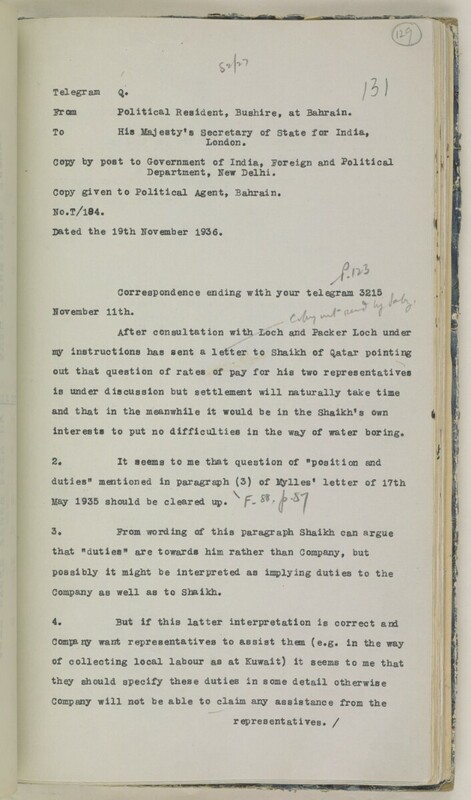 Copy given to Political Agent A mid-ranking political representative (equivalent to a Consul) from the diplomatic corps of the Government of India or one of its subordinate provincial governments, in charge of a Political Agency. , Bahrain. Dated the 19th November 1936.
interests to put no difficulties in the way of water boring. Company as well as to Shaikh.